Trinity Place Behind Trinity Church - 1861. This is a beautiful view of Trinity Place in New York City issued by D. T. Valentine. The view looks southward on Trinity Place with Trinity Church and the Trinity Church cemetery on the left. It features a gravedigger near a grave, some trees and bushes in the foreground and surrounding buildings. 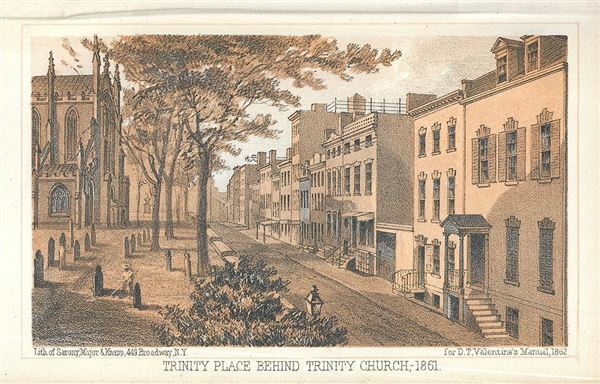 Illustrates the third and current Trinity Church buildings, built in 1846, which, with its spire and cross was the highest point in New York until 1890. This view was engraved by Sarony, Major and Knapp and published as part of D. T. Valentineâ€™s Manual of the Corporation of the City of New York, 1862. Valentine, D. T., Valentine's Manual of the Corporation of the City of New York, (New York) 1861. Very good. Minor toning along edges.